The Republican Senator took back her remarks after the debate, saying she "misspoke"
Opponents of Republican U.S. Senator Kelly Ayotte launched a new round of attacks Tuesday following a debate gaffe where she said she "absolutely" considers Republican presidential nominee Donald Trump a role model, a comment she later took back. Ayotte's opponent in the Senate race — Democratic Gov. Maggie Hassan — put out a new web ad on Tuesday morning that included Ayotte's "absolutely" remark followed by a series of some of Trump's controversial statements about women. Hassan's campaign also held a press call on Monday morning in an effort to keep the focus squarely on Ayotte's debate night mistake. Former New Hampshire Democratic Party Chair Kathy Sullivan said on the call that she is "still picking her jaw up off the floor" following Ayotte's debate miscue. "Kelly Ayotte should explain to the people of New Hampshire exactly what about Donald Trump she thinks the children of New Hampshire should emulate," Sullivan said. State Sen. Donna Soucy added that she was "appalled" by Ayotte's remarks. She said Ayotte has been "trying to tiptoe around what exactly her support of Donald Trump really means. Now we know." Sullivan said she doesn't believe Ayotte "misspoke," as she said in a statement issued about three hours after Monday night's debate. She said she thinks Ayotte walked back her comments about Trump only after seeing all of the negative reaction on social media. "There was no confusion on her part," Sullivan said. "In the follow up, she said exactly what I think she meant." "She had a second chance at the question," added Soucy. "She essentially doubled down. It's really clear where she stands." The New Hampshire Chapter of Moms Demand Action for Gun Sense in America — a group started by former New York Mayor Michael Bloomberg — also issued a statement Tuesday morning in response to Ayotte's comments about Trump. "It’s no surprise that Kelly Ayotte has called Donald Trump a ‘role model’ because both of them adhere to the extreme agenda of the NRA leadership — guns everywhere, at any time with no questions asked," the statement read. "Ayotte may try to distance herself from Trump and her own record on guns, but Granite Staters know the truth: Ayotte consistently votes with the gun lobby and against her constituents — 80 percent of whom support criminal background checks for all gun sales." Analysts Ayotte's gaffe could cost her the race, but some New Hampshire voters seem to be more forgiving. Denise Coglin of Nashua said Ayotte can successfully clarify what she said and move on. “It’s done all the time, I think you can, some people do misspeak,” Coglin said. Ayotte, speaking to reporters Tuesday morning, reiterated to reporters she misspoke. 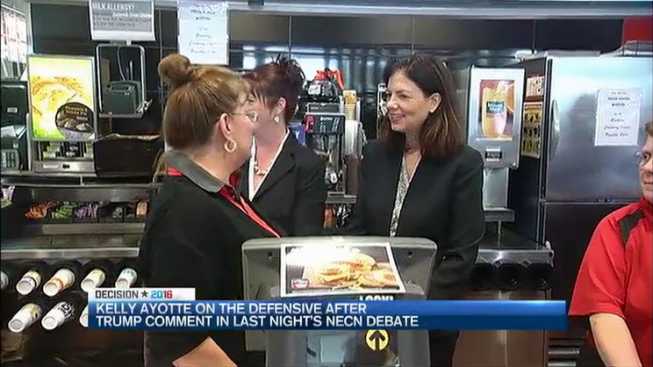 New Hampshire political analyst Scott Spradling says Ayotte’s answer is a misstep. “I presume the polls will show the needle moving in Hassan’s favor following this debate,” Spradling told necn Tuesday. But he says in a senate race this tight, one comment won’t decide the outcome. That “challenge” Spradling is referring to, is walking the fine line where Republicans say they’re supporting Trump but will not endorse him. It’s a confusing campaign tactic that got Ayotte into trouble. Ayotte and Hassan will face off in four more debates prior to the general election.